We’re working in cities across the world to meet energy demand through resilient and sustainable supply. Can we power cities sustainably? Day and night, cities consume the majority of our energy. From always-on buildings to electric vehicles, cities require a smarter and ‘whole systems thinking’ approach to energy generation, storage and use. Effective urban energy requires solutions that are a combination of affordable, digital, resilient, local, innovative and forward-looking. It means addressing local governance issues, embracing the digital era, considering lower carbon sources like hydrogen, and using alternative funding options in order to provide sustainable, and affordable infrastructure that can power our city lives. We apply skills and expertise taken from areas such as renewables, and apply them to urban energy programmes to obtain smarter, sustainable and long term outcomes. Find out how we reduced operating costs by 35% for a whole district in Hong Kong. Urban energy, increasingly powered by digital tools and driven by changing consumer habits and expectations. These bring new opportunities for new and existing players, with business models that respond to individual cities’ needs. We work with operators and suppliers to ensure their proposed business model is realistic, profitable and sustainable. We help clients to design and operate new energy storage systems, which are vital for energy growth and sustainability. Innovative projects like the UK’s first battery-driven energy storage centre at Blackburn Meadows, for Eon energy, demonstrate how renewable energy can make a more continuous contribution to the energy supply cities depend on. Investors can see the energy market is changing, but need the confidence to make the right calls. Our advisory services team know the market inside and out, helping clients across the world’s energy markets to develop business cases that represent the best long-term return on that crucial investment. As cities move to a more complex but more flexible energy system, existing suppliers need to adopt real time systems that respond dynamically to changes in price and demand. We help energy operators to adapt to these future systems enabling them to join the new era of energy. With the speed of technological development, regulation of energy markets is also changing. We help clients to shape a path through the developing regulation that governs energy generation, distribution and transmission, to ensure their businesses stay aligned to the shape of the market. Expanding use of renewables including rooftop solar has brought the cost of the technology down and allowed it to be more accessible. Most buildings can use the available space they have to become a ‘prosumer’- earning money from its contribution back to the wider energy grid. We help energy operators, distributors and policy makers alike build more flexible and sophisticated energy networks ready for a new generation of urban consumers. Learn more about how the way cities produce and consume power is changing. A more complex mix of traditional energy sources and growing renewable capacity, requires a more flexible means of distribution, one that can adjust to real-time changes in demand with reliable, affordable power. This new approach is called transactive energy, where instead of a single grid, many different players contribute, consume and earn in a dynamic market model that blurs the lines between producers, distributors and consumers. The next few decades are expected to be among the most transformative the energy industry has ever seen with billions being invested to ensure the system is fit for the future. 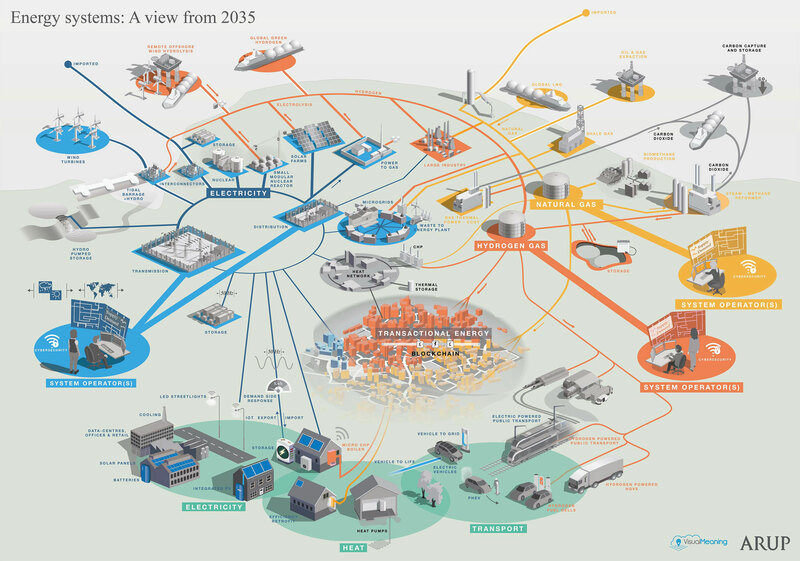 By 2035 we envisage a world with a much more diverse range of heating sources, with significantly lower emissions, and where all new vehicles are electric. We’re working with clients across the energy market to ensure they are future-proof, from new business models to upgraded infrastructure. We’re working with clients to optimise transmission and distribution, whilst working towards a balanced and reliable energy system including microgrids, smart storage solutions, heat networks and hydrogen. Microgrids provide power to specific networks of users, with supporting storage, making them ideal for organisations like hospitals or banks, who rely on an uninterrupted energy supply. How can we store energy? Incorporating distributed generation and storage improves the way buildings consume energy and enables landlords to potentially enjoy new revenue streams, boosting the percentage of renewables in the overall mix. In a 21st Century energy network we have power being generated at many levels and demand is becoming more variable and less predictable. In our current and future network, storage is the only way to achieve efficiency and reduce long term power costs. Can non-fossil fuels meet our heating needs? Non-fossil fuel powered heating becomes possible when the grid is able to use a wider range of renewables, more of the time. District heating infrastructure can be used to lower the environmental impacts of keeping offices and homes warm. Could hydrogen be the future? Hydrogen power is becoming more viable, bringing the prospect of lower carbon power to vehicles and businesses. Read more about how we’ve designed and produced an exemplar hydrogen powered centre in Yorkshire.